Investors interpreted the results of the general election as favorable to the industry, but a few stocks reported other news today as well. While many biopharma stocks are receiving a boost today from the results of the general election, others are padding gains with additional favorable information. The list includes Sucampo Pharmaceuticals (NASDAQ:SCMP), MannKind Corporation (NASDAQ:56400P706), and Ariad Pharmaceuticals (NASDAQ:ARIA) -- all up between 9% and 33% today -- among others. The quick takeaway from today's big jumps across the biopharma industry can be summed up quite simply: Investors are hopeful that stricter regulations on the industry, specifically regarding how drug prices are set and how fast they can rise, will be less likely after Republicans won both houses of Congress and the White House in Tuesday's federal election. 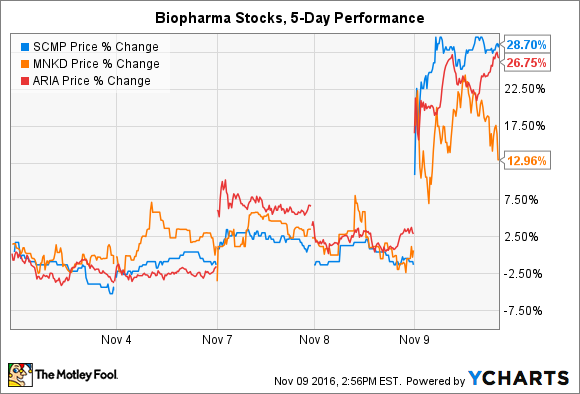 That removes uncertainty and risk for investors, which has spurred biotech gains in the immediate aftermath of the election. On top of that, several biopharma stocks are adding to those gains through earnings news and pipeline updates. Sucampo Pharmaceuticals gained over 30% today after announcing solid third-quarter earnings. Revenue jumped 73%, and EPS climbed 19% compared to the year-ago results, driven largely by its flagship product AMITIZA. The drug regulates ion channels in the human body and has been approved to treat chronic constipation, irritable bowel syndrome, and opioid-induced constipation, as well as select other ailments. Its strong performance is expected to deliver full-year 2016 revenue of at least $220 million and adjusted EPS of at least $1.20. While the company did announce a failed trial for AMITIZA, the growth and additional ongoing trials allowed investors to shake off the development. SCMP Price data by YCharts. MannKind Corporation also reported third-quarter earnings on Wednesday morning. At first glance, the company appears to be making solid progress. Quarterly revenue registered at $162.4 million -- compared to zero in the year-ago period -- and EPS of $0.26 also handily beat last year's performance (a loss of $0.08 per share). But investors digging deeper will notice that the long-term health of the company could be in jeopardy. Most of the revenue came from a partnership with Sanofi that no longer exists, and cash dwindled to $35.5 million at the end of September. In other words, this move is probably not sustainable. Ariad Pharmaceuticals reported third-quarter 2016 earnings on Monday, but today it announced that phase 1/2 data for an early-stage drug candidate was published in journal The Lancet Oncology. The drug, brigatinib, which is being evaluated for treating a specific type of metastatic non-small cell lung cancer in patients that are resistant or intolerant to another commonly used drug, provoked a response in a majority of patients and yielded median progression-free survival of over one year. The data will be included in the company's New Drug Application for the drug, which has received the Breakthrough Therapy designation from the U.S. FDA and will be evaluated by the institution in April 2017. As investors generally interpret the election results as a boon for business in the pharmaceutical industry, several companies are stacking gains with more specific news. Investors have to acknowledge that some of the gains may be short-lived and remember that clinical data and growth will be the long-term drivers of the biopharma stocks they own.